Whilst sorting out my Christmas gifts, I have found this little Peppa Pig bundle for you to win. Tilly may be 8 years old but she is still a fan of Peppa and she thinks that Rebecca Rabbit is a hero for holding about 60,000 jobs and still being able to have a social life. I have no idea how she does it but she is a pretty good role model for my kid. She shows that you can do any thing that you want to do. 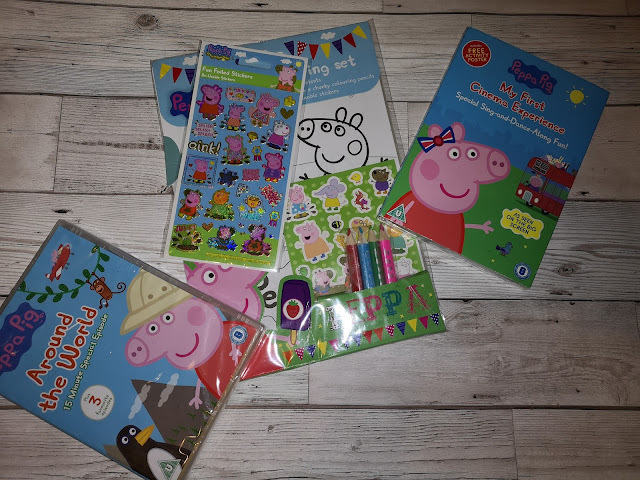 So to be in it to win this bundle, all you need to do is pop over to this blog post (Click the link) and leave a comment about the new Peppa Pig Secret Surprise that was launched this week, in time for Christmas. They cost £9.99 and are aimed at pre school children but Tilly is 8 and would still play with them. A sheet of shiny stickers. Peppa Pigs First Cinema Experience, the full movie that is interactive and kids will love to sing along with it. A short DVD of Peppa Pig. You can leave an anonymous blog post, but I wont be able to contact you if you win.